Union of Donetsk and Lugansk republics set sovereign border | Russian Legal Information Agency (RAPSI). DONESTK, July 16 (RAPSI) – The union of the self-proclaimed Donetsk and Lugansk people’s republics in eastern Ukraine has announced that their borders are the borders of sovereign states. 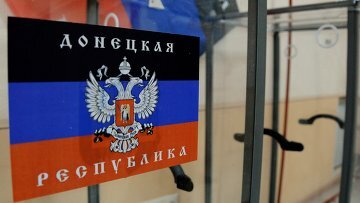 “The Parliament of the Union of People’s Republics (…) is thereby announcing that the common external borders of the Donetsk People’s Republic and the Lugansk People’s Republic are the borders of sovereign states,” reads a document published on the Donetsk republic’s Twitter account. The Kiev government started a military operation in eastern Ukraine against local residents who refused to recognize the February coup in mid-April. The operation has claimed hundreds of lives on both sides and forced thousands to flee their homes in eastern Ukraine. Russia has repeatedly urged an end to the punitive operation. 11:51 16/07/2014 The union of the self-proclaimed Donetsk and Lugansk people’s republics in eastern Ukraine has announced that their borders are the borders of sovereign states.